Chabot Annual Fund: Thank You Families! We’re excited to announce that we’ve achieved our fundraising goal for the 2015-2016 Chabot Elementary PTA fall Annual Fund campaign! Thank you to the entire Chabot community for making this year’s campaign a huge success. 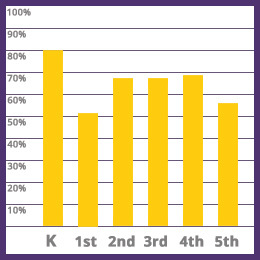 With your support, 65% of Chabot families participated and exceeded the previous year by more than 15%! More than 500 individuals joined the PTA and donated more than $180,000 to the Annual Fund. Way to go, Chabot! This generous income will directly support the programs sponsored by the PTA and help to reach the required annual budget of $500,000. PTA Membership Drive: We have two winners! Mr. Nagatani’s kingergarten class earned a pizza party sponsored by Jules Thin Crust Pizza. They can start working on their pizza that will be added to the Jules Thin Crust menu for a limited time. This will be featured at the College Ave store and will proudly be titled with their class name. With such a tight race, we could not deny our honorary winner. We are also proud to announce that Ms. Olrich (aka Ms. Leslie) second grade class earned a pizza party from Jules Thin Crust. Annual Fund Campaign: We also have two winners! Ms. Forward’s kindergarten class (82%) and Mr. Nagatani’s kindergarten class (86%) will receive an ice cream party sponsored by CREAM. Congratulations! We would also like to extend a special thank you to all of our teachers and room parents who helped support the campaign. Donate Anytime by completing the donation form and dropping it off at the PTA membership box outside the main office. If you have any questions about your Annual Fund contribution or need to confirm your PTA membership, please email us at annualfund@chabotelementary.org. All Annual Fund participants will receive a letter in January with your donation information that can be used for tax purposes.